In this Osprey Ariel AG 55 review, I present an ultimate backpacking tool, one of the most sophisticated packs ever built. So, keep reading. 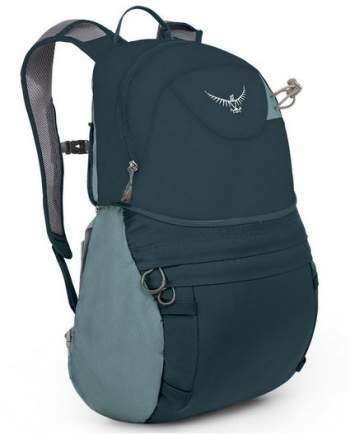 Osprey Packs Women’s Ariel AG 55 Backpack. Three possible sizes of the pack to choose from. Four possible sizes of harness and hip belt to choose. One of the most advanced suspension systems. Moldable hip belt and harness. Interchangeable both the hip belt and the harness. Attachment points for the Osprey Daylite pack. The top lid converts to a fully functional daypack. Extra side entrance in the new model as compared with a J-shaped zippered extra front entrance in the previous version. There are small differences in the dimensions and in the weight. 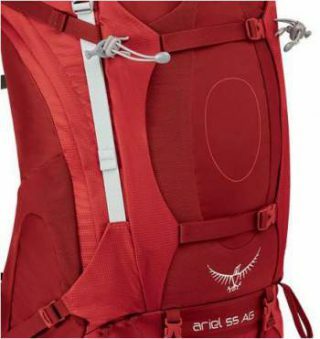 The Ariel AG 55 is one of three packs in the series which also includes the packs of 65 liters and 75 liters. In spite of the number 55, the pack comes in three different volumes of 49, 52, and 55 liters. The same holds for the mentioned bigger packs 65 and 75, so in reality, you have 9 possible sizes in the whole Ariel series. This is already very remarkable. The torso length is adjustable. But this is not all, it is possible to choose between 4 different sizes of the harness, XS, S, M, L. No, this is not all again, the same also holds for the hip belt, you can choose one out 4 possible sizes. But there is more, see below in the suspension section. The pack is a top-loading type, so you have a removable lid and collar. However, as mentioned above, there is an extra zippered access to the main compartment on the left side of the pack. When the lid is removed you have an additional integrated flap (see the picture below) with buckles to close the pack properly. So it again looks like a normal top loading pack, yet considerably shortened. The integrated flap to use when the lid is removed. The suspension is based on a frame which includes a LightWire peripheral aluminum alloy structure and a central stay. You will notice that this version of the Osprey’s AG system is different from what you have in the Atmos and Aura series, and in the smaller packs Mira and Manta. But the 3D mesh of Ariel AG 55 looks really cool. The hip belt is with custom heat molding and it will then mold naturally by your body heat to fit you perfectly. It is also interchangeable as mentioned above, so you can choose your best fit in the moment of purchase. The same is with the harness, it is interchangeable and moldable, and you can choose the size. The molding implies a break-in time but you can speed this up by using Osprey’s oven for this purpose. These ovens are usually available in better outdoor shops. We have one in Leuven in Belgium where I live. You simply slide your hand between the back panel and harness, and then release hook and loop attachment which is there. After that move the harness into the desired position, and press the harness firmly to re-engage the attachment. As you realize this is an extra bonus of this series, in both old and new versions. Family members can use the same pack, but they may have their own specific molded hip belt and harness to ensure a perfect fit. The StraightJacket compression system. The attachment points for the Osprey’s Daylite pack are under the flaps. Also visible are dual tie-offs and dual attachment loops for ice axes. From the picture here, you can see two vertical flaps with horizontal straps on the front of the pack. This is what they call dual front compression system with StraightJacket compression. When you undo the straps, you will notice that underneath the flaps there are 4 attachment loops. These loops are used to attach Osprey Daylite pack, which is designed for such a purpose and it can be added to many of Osprey’s packs. This is yet another great bonus of the pack. 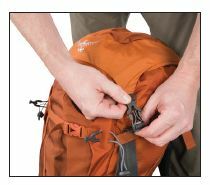 After the Daylite pack is attached, you can additionally secure it with the mentioned horizontal flaps and the straps. The DayLid daypack – front view. Shoulder straps are with a pleasant mesh and edgeless wrap. You have dual access to the main compartment, from the top and from the front. You also have an adjustable chest strap. The sternum strap of this DayLid pack can be fixed to three different positions. There are 3 loops for this purpose on each of the shoulder straps. Naturally, those loops that are not currently used for the sternum strap, can be used for the attachment of equipment. There is a zippered pocket. There is an external hydration sleeve with a hanger for the water bladder. On the bottom, there is a tuckaway attachment loop and higher up is a bungee cord visible in the picture above. This is to attach an ice axe. There are 4 attachment webbing loops on the lower front section, they are visible in the picture above. In fact, they are from the top of the lid, so now you have them on the front of this daypack. I have already mentioned 4 webbing loops on the lid. Apart from this there are also two big attachment loops on the bottom and they come in pairs with bungee cords higher up, you can see them in the images above. This is to attach two ice axes. There are two compression straps on each side of the pack. The lower straps are with InsideOut features, so they can be routed inside the side mesh pockets to compress pack when not full to ensure its stability, or over the pockets to secure items in them. There are two removable compression straps on the bottom. On the front, you have the already mentioned StraightJacket compression straps and two vertical flaps. 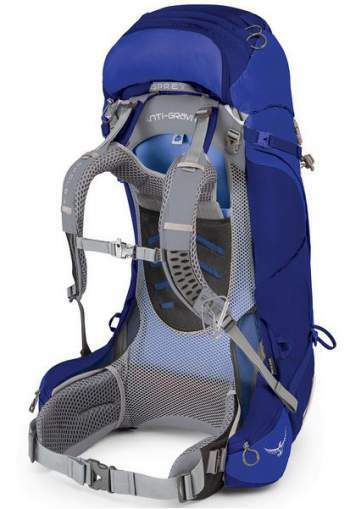 The pack comes with Osprey’s Stow-on-the-Go trekking pole attachment system. This is one of their great inventions used in many packs from this brand. It is used when you need free hands on the fly, to do some scramble, to eat or drink when on the go, or to take a photo. The pack is with a separate bottom compartment with the usual zippered entrance. The divider between the main compartment and the bottom section is collapsible so you can use all the space as one compartment if you wish so. The pockets system includes dual side stretch mesh pockets, dual zippered hip belt pockets, the mentioned pockets on the lid, and one large stretch mesh pocket on the front. The side stretch mesh pockets are with dual access from the top, and from the side. This is very useful to access the bottle when you are on the go. The pack is indeed on the heavy side, but this is not a true objection. Just see what it offers, so the weight is the consequence of so many useful features. My concerns are about ventilation and lumbar support. I was writing more about this in my text about Aether AG 60, so you can have a look there. These are packs with almost identical designs. In short, I am convinced that the ventilation in this design is not a match for the tensioned mesh systems in some other packs of Osprey (like the Exos 58) or in other brands like Deuter Futura Vario 50 and in Gregory Zulu series. But this is only for the back side of the pack. In the lumbar zone, the ventilation in this Ariel AG 55 system is better than in the mentioned packs with the tensioned mesh. In the hip belt area, the Ariel AG system is definitely better because of the ventilation gap between the belt and the rest of the structure with the hip belts. There is perhaps a downside of this lumbar ventilation. Namely, I have some concerns about the lumbar zone support. 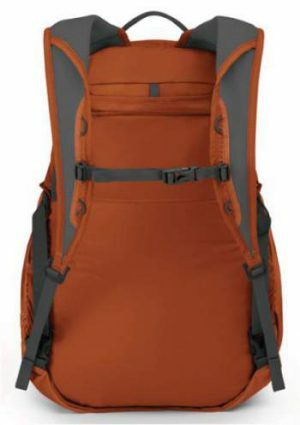 This is a specific AG design without the usual massive lumbar padding (this is why the ventilation is better) which you have with other packs in this size range, see for example Deuter Futura Vario 55+10 SL, yes they also have a specific women version of the pack, the letters SL indicate this. But this lumbar padding might be needed here. The time will show. I have been in touch with Osprey about these issues and all is described in the Aether AG 60 text. See here some basic features of the Ariel AG 55 compared with two of its top competitors. As you realize, nothing is missing in the Maven 55 pack, but see the weight. Please follow the links for more, and check also the prices. Frame: peripheral wire plus a central stay. – XS: 49 liters (2990 cubic inches). – S: 52 liters (3173 cubic inches). – M: 55 liters (3356 cubic inches). – XS: 2.19 kg (4.834 lb). – S: 2.21 kg (4.883 lb). – M: 2.24 kg (4.932 lb). Carry weight: up to 27 kg (60 lb). – XS: 14 – 17 inches (35 – 43 cm). – S: 16 – 19 inches (40 – 48 cm). – M: 18 – 21 inches (46 – 53 cm). IsoForm harness sizes to choose: XS, S, M, L.
– XS: < 28 in (71 cm). – S: 27 – 31 in (68 – 79 cm). – M: 30 – 34 in (76 – 86 cm). – L: > 33 in (84 cm). – XS: 29.13 x 14.96 x 12.2 in (74 x 38 x 31 cm). – S: 31.1 x 14.96 x 12.2 in (79 x 38 x 31 cm). – M: 33.07 x 14.96 x 12.2 in (84 x 38 x 31 cm). – Main: 210D Nylon Dobby. – Accent: 210D High Tenacity Nylon Shadow Box. – Bottom: 500D Nylon Packcloth. Sleeping bag compartment with a removable divider. The lid transforms to a daypack. Adjustable sternum strap with emergency whistle. Integrated FlapJacket to use when the lid is removed. Dual zippered hip belt pockets. Dual access side stretch mesh pockets with Inside-Out compression straps. Stow-on-the-Go trekking pole attachment system. Dual ice tool loops with bungee tie-offs. Guarantee: Osprey’s All Mighty guarantee applies. You can compare the numbers given here with those in the previous version. There are small differences in the size of the pack and in the weight. Regardless if one likes this design or not, in my view, this is one of the most sophisticated backpacks ever built. So many adjustability options you will not find in any other series on the market. No other pack is a match for the Aether/Ariel series, and this holds for both the previous and the new version. The convertible lid and the DayLid daypack is truly an ingenious design. There is nothing on the market that would come close to this. I love the pack and can fully recommend it. If you can afford it, do not look further. This is a top-notch tool. But you might still want to compare this pack to the Deuter Futura Vario 45+10 SL pack for women. If you need a bigger pack, see the Ariel AG 65 in my separate text. The corresponding version for men is the Aether AG 60, described in detail in my separate post. Thank you for reading. I hope this text has been useful to you. If this is so, please share it with others. If you have any question or comment, please use the comment box below. Have a nice day. hi, the dimension states H*W*D. Can I know what does the D stand for? Is it dimension? Hi, the D means depth, the distance in the direction from the body; H and W are for the height and width.